to discuss your welding-related problems or tasks. or do you just want to stop by for a cup of coffee? Doesn‘t matter, we appreciate your visit! welcome you at our booth. after four years the Schweißen & Schneiden fair comes back to Germany. 25th to 29th September 2017. We will be there too and are happy to present you our latest welding wire QuEISI. Also you can test the ALV system from Alpha Laser at our stand. Therefore we would like to invite you to visit us at the fair in hall 11, booth D18. stop by for a cup of coffee? Please contact us to request your personal voucher by e-Mail (co.thiel@quada-office.com). We are looking forward to the Schweißen & Schneiden and especially to welcome you at our booth. 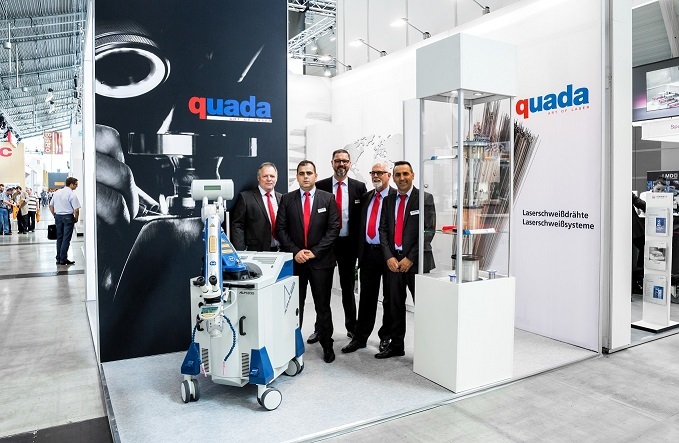 Experts from tool making, model and mould making industries met at the Moulding Expo in Stuttgart for the second time. Of course we’ve been present for the second time too. This time with a complete new stand, but equally motivated as 2015. It was a pleasure to welcome our visitors on our new stand and to have intense conversations. Customers and interested parties could get information about our welding wires, laser systems, our service and also our novelties. There was also space to give advices on specific welding assignments as far as known. The Moulding Expo 2017 was a great success for all participants and we would like to thank our stand builder Live Project and our colleagues for such great cooperation. for the second time we are attending at the Moulding Expo from May 30th to June 2nd. After the first time was so successful we are curios what will happen this year at the fair. Therefore we would like to invite you as our guests. Please make sure to get your personal voucher by mail (co.thiel@quada-office.com) or by phone +49 2304 - 966 38 22. We are looking forward to see you at our stand 3B20 in hall 3. Please visit us for expert discussions or just a cup of coffee. We're waiting for you. We would like to inform you that this year our last ship day will be the 20th of December 2016. We will have our annual stocktaking from the 21st until the 23rd of December, but of course we are still available for you by phone or e-mail during this time! From 27th until 30th of December we are completely closed for Christmas & New Year holiday. Our first ship day will be January 2nd 2017. We wish you all a wonderful Christmas time and a successful year 2017!